With more than 12 different culinary categories of beans, it can be difficult to decide which types of beans are right for your cooking needs. Northern beans, which are most often called great northern beans, are white beans made of mature, dried green bean seeds. Garbanzo beans, also known as chickpeas, range in color from cream to black, and they are known for their nutty, buttery flavor. 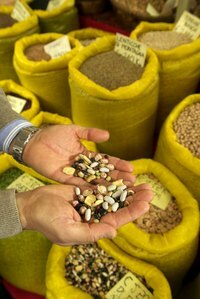 In appearance, great northern beans look similar to lima beans in shape, and they are white in color. Their size is medium to large. The flavor of great northern beans is very delicate. In fact, when they are cooked with other ingredients, they will absorb the flavors of those ingredients. Great northern beans are in season all year round. If a recipe calls for great northern beans, it is possible to substitute any white beans in their place. Various recipes use great northern beans as ingredients. Examples of these recipes include baked bean side dishes, stews, soups, casseroles, chili and salads. Get creative by adding great northern beans to your own favorite soup or chili recipe for a hearty addition. Garbanzo beans are from the Middle East, originally, but they are common ingredients in numerous cultures around the world. These creamy, nutty-flavored legumes have many health benefits, including decreasing the risk of cardiovascular disease, helping with the regulation of blood sugar and supplying antioxidants. Garbanzo beans are also rich in protein, fiber, folic acid and manganese. Recipes made with garbanzo beans include numerous soups, salads and casseroles. Garbanzo beans can also be used to make hummus, stew and burgers.